I posted a blog post a few weeks ago about tips when buying used film cameras. I use these tips all the time. However, even when you "know" what you are doing there are still issues. Last weekend I purchased 2 SLR's from a "flea market" seller I've used before. Generally the quality is good, but I've occasionally had minor issues. 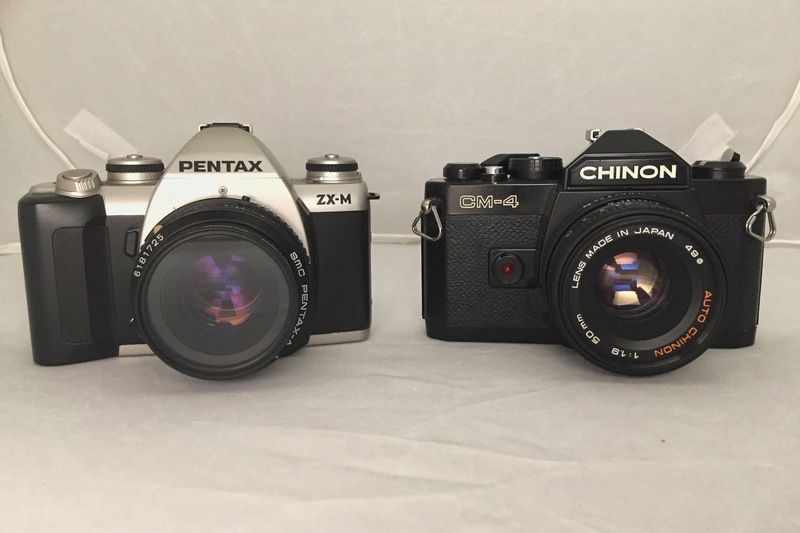 I purchased a Pentax ZX-M that I've wanted to get and a Chinon CM-4 which I'm not 100% familiar with. Both looked clean and from my on sight inspection they looked good to go. I loaded the Pentax tonight with a roll of FujiColor Superia X-TRA 400. Loaded A-OK. However, as soon as I pushed the shutter release button the film rerolled into the canister. Weird. OK, I opened the camera and using a trick I learned I retrieved the film leader. Reloaded the camera, pushed the shutter release and same thing happened. Either the film was jammed enough that the camera thought the film was at the end, or there is an electrical glitch. I'll have to deal with it later. On the positive side, I retrieved the film leader again and loaded it into the Chinon. Loaded well, light meter seemed to work and I took a few shots. Batting 500 with this purchase.